The Nissan 350Z filled a Z car-shaped hole in Nissan's line-up caused by the departure of the 300ZX in the year 2000. The Nissan 350Z filled a Z car-shaped hole in Nissan's line-up caused by the departure of the 300ZX in the year 2000. Something of a back-to-basics machine, the 350Z's brawny appeal echoed that of Nissan's earliest Z cars. Offered as a two-seat coupé initially (a roadster following in 2004) with a 3.5-litre V6 engine driving the rear wheels, the 350Z was an relatively inexpensive way to have Porsche Boxster rivalling performance. 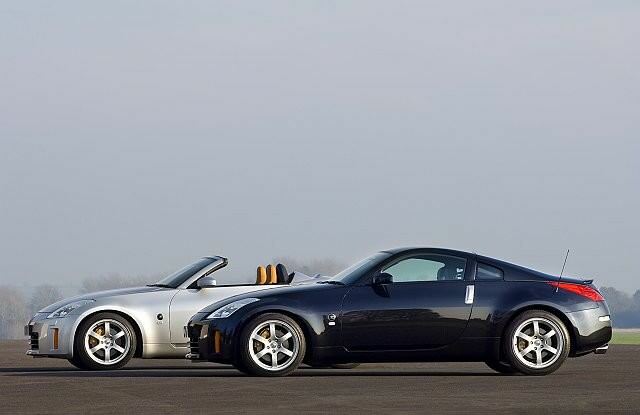 Its replacement, the Nissan 370Z, still offers much the same today. Officially introduced in Europe in 2003, a few early Japanese models were imported to fill the strong demand from Z car fans in both Ireland and the UK. Japanese cars are badged Fairlady and slightly different in their specification; most notably the interior trim and plastics aren't of the same quality as the official European-designated models. The best advice with the Japanese cars is to avoid, as there are plenty of officially imported cars in Ireland to choose from. They feature a revised interior, with improved plastic, but don't expect premium levels of tactility inside; it's still fairly basic, which kind of suits the car's raw and purist mantra. Power comes from a 3.5-litre V6 - hence the 350 name - it delivering 280hp in standard trim, though many have added performance exhausts and other tuning parts, as Nissan offers plenty of options to do so via its Nismo tuning wing. The coupé was joined by a roadster in 2004, both on sale until 2008/2009 when they were replaced by the more curvaceous 370Z. The standard transmission in all was a manual, with a five-speed automatic also offered. Being a two-seat coupé, practicality is a problem, and the boot is small and shallow. There is a pair of stowage bins behind the seats and that's about it. Specs were fairly simple, with the standard car and GT Spec available. Nissan offered some fairly wild leather seats, with baseball glove like stitching too. 2005 would see mild revisions to the interior and exterior, options like Bluetooth connectivity and a 300hp version of the engine, dropping the 0-100km/h time to 5.8 seconds. More changes followed in 2007, power rising again, this time to 313hp, knocking another 0.1 seconds off its 0-100km/h time. None are likely to disappoint with the performance, but later models do come with more standard equipment and a higher quality interior than the earlier cars. GT spec adds some luxury, though all cars feature air conditioning as standard and alloy wheels. The manual gearbox is the only choice too, as the automatic doesn't suit the 350Z - and it's not available on later cars. Nissan's 350Z isn't for the fainthearted, though its raw, brawny performance is part of its enduring appeal. A similar age Porsche Boxster will provide a more rounded ownership proposition, but the 350Z will be cheaper to buy. Running costs will be fairly punitive though.